Everyone wants to tell you that the key to weight loss, maintaining a balanced diet, and living a healthy lifestyle is finding what works for you. They just forget to mention how you're supposed to find it and what working for you really means. Macro-shaming was a big deal throughout the early years of trendy diets. By nature, we wanted to point the finger at one certain food group, blame it for causing weight gain, and avoid it at all costs. Carbohydrate and fat quickly became the most feared and disliked macronutrients, which left protein to fend for itself. And I'm sure somewhere along the line, someone tried to avoid all three - you know, the good old water diet. Recently, there has been a very big shift in the diet and nutrition industry. We've realized that carbohydrates are not the enemy, fats don't necessarily make you fat, and protein won't make you 'grow muscles' like a man - but that would be nice. More and more people are approaching diets in a more "balanced" way, striving to find what works for them, and eat a little bit of everything in moderation. It might not be #science backed or black and white, but it is working and it's helping to build healthier relationships with both food and our bodies. During my freshman year of college, I gained nearly twenty-five pounds from generic peanut butter, frozen meals and synthetic protein bars. I was terrified of carbohydrates and I was doing everything I could to avoid them. After I gained the unexpected weight, I was in such a strange place, both mentally and physically. I have never weighed anything over 125 pounds, give or take, so reaching that 150 mark was confusing. I didn't understand how I got there, what I was doing wrong, or who to believe. I was counting macros like crazy, eating tons of protein, and going to the gym seven days a week - how could I have gained weight? Truth of the matter - it wasn't about what I was eating, it was about the foods that I wasn't eating. Instead of having half of an avocado with my eggs, I was having a Quest bar with a side of protein water. Instead of having a slice of whole grain toast after my workout, I was binging on cinnamon Chex Mix cereal. I wasn't eating real food with real worth and real nutrients.I was depriving my body of the micronutrients like vitamins and minerals, just to make sure I was 'hitting' all of my macronutrients. I found what works for me through twenty-five extra pounds, stretch marks, and not so happy thoughts. It was one of the hardest lessons I have ever had to learn and as much as I wish I didn't put my body through such drastic changes; I wouldn't change my experience for the world. I love this new (and improved) direction; however, I fear that it might be too simple. We like to complicate things, especially as females, and we hate to believe that something could really be as simple as 'eat vegetables most of the time, eat pizza sometimes.' Something in our brain tells us, "Nope! Lets make this as complicated, drawn out, and as miserable as possible!" Where in reality, it really is that simple. There are a few new key phrases hanging around the nutrition community such as "balance, listen to your body, and find what works for you!" Again, I love where this new direction is taking us, but it's troubling to know that many of us say these things without fully believing in them, or even understanding what they truly mean. Balance and listening to our bodies means something different to all of us, and they might not always go hand in hand. I know many people who love to count calories, have some sort of structure, or follow a detailed meal guide. I know many people who just take it day by day, eat whatever they want, and make it totally their own. Neither being the 'right or wrong' way to do things; just doing what works best for that individual. It took me quite a while to find what works for me and it's why I am so passionate about sharing my experience. Finding what works for you isn't a program that you can buy or a shake that you can drink. 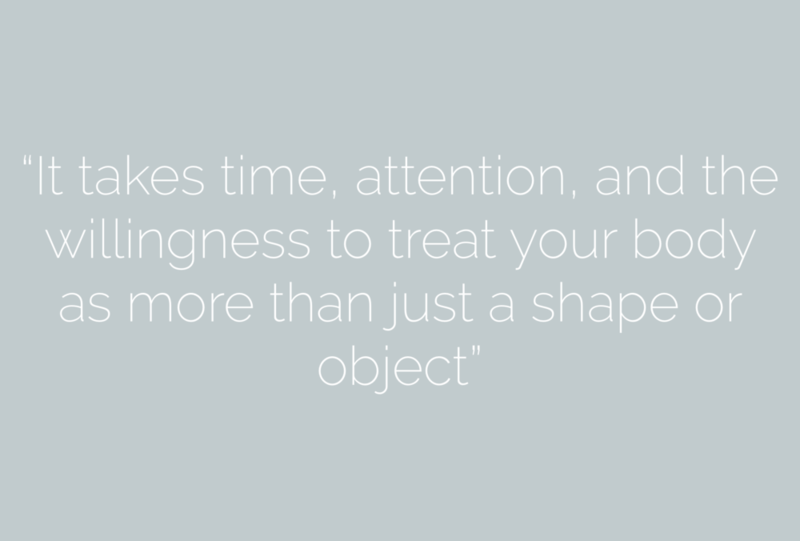 It takes time, attention, and the willingness to treat your body as more than a shape or object. It's more than a trendy tag line, hashtag, or nice thought. Finding what works for you is your forever diet, your lifestyle, your health, your goals, your you! It's truly living as the healthiest you. First things first, you have to figure out why you're starting, or have started, this journey in the first place. Are you looking to lose a substantial amount of weight or are you looking to 'tone up' and look better? Are you trying out a new way of eating such as Paleo or are you looking to create a better relationship with food? There are so many possibilities and it all depends on what you truly want to accomplish. Grab a pen and paper, sit down, and sip on some humble tea. It's time to be completely honest with yourself! This is often times the most challenging part of setting new goals. I tend to over-think it and write down what I know I should, instead of how I really feel. It helps if you just take a deep breath and think about what makes you happy. Food makes me really, really happy and that is something I've had to work with. I'm not willing to completely give up pizza and tacos, so I've created my goals around it. Such as, I aim to only eat pizza once a week and continue to eat healthy foods on the other six days. We all have different goals because we all want different results. At one point, I wanted to be the strongest girl in the gym and I didn't care about how many calories I needed to eat to get there. That was my goal at that moment in time, and it wasn't right or wrong. It's definitely a lot different from my current goals, but we're always changing and that's never necessarily a bad thing. Back to your pen and paper; start by jotting some things down that you can accomplish within the next few weeks - short term goals. Maybe something like walking 10,000 steps a day, running at least 3 times a week, or losing 1 pound per week. Short term goals are great motivators while you're working towards your long-term goals. Next write down a few long-term goals such as, building a healthier relationship with food by eating intuitively or enjoying a "treat meal" once a week and not feeling guilty. Whatever your short or long term goals may be, just remember that they are personal and nothing is off limits. I've always felt like writing something down made it permanent and by writing down your goals, it's like you're making a promise to yourself. Not only are you thinking about change, but you're actively doing something to create that change. The first step of finding what works for you is figuring out your goals. You have to dip deep, forget about feeling dumb or wrong, and be completely honest with yourself. Why do you want to eat differently? Why do you want to exercise? What do you want to accomplish for yourself? Whether you want to lose weight, gain muscle, look better, or most importantly feel better - there is no wrong answer because they are your goals. Life is busy and life is not always routine. You might not always have time to consume aesthetically pleasing breakfasts or buy a ten-dollar Bullet Proof matcha latte, and that is perfectly fine - actually it's more than fine - it's real life. One thing that will never change is the need for food and if you think about your diet as being apart of your every day life, your perception of what to eat begins to change. You have to take a look at your life, your daily routine and what is available to you, in order to make a realistic plan. Your life, your habits, your routine, and your preferences are completely personal. We often fall into thinking that if something worked for her, then it has to work for me - "if she doesn't eat gluten and looks "healthy," then I shouldn't eat gluten to look healthy." The first problem about this oddly relatable scenario is that social media only shows you a slice of someones life, and it generally isn't the most honest slice. So, something that looks like it might work for someone, might not actually work for someone. The second problem is if you eat according to someone else's body, you will never truly be able to figure out your own. 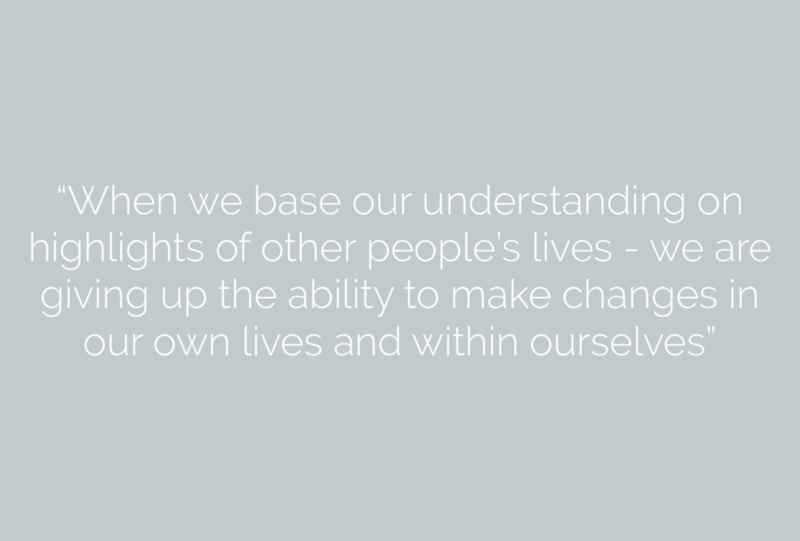 When we base our understanding on highlights of other people's lives, meals, and bodies; we are giving up the ability to make changes in our own lives and within ourselves. We look to these pictures and "influencers" as what we should look like or how we should eat, instead of asking ourselves those two very important questions. Finding what works for you means taking a look at your life, planning healthy meals around crazy schedules, and eating according to your own preferences. If you find that you're always on the go or starving in between classes and meetings, set a day to meal plan and prep a portable lunch and healthy snack option. One of the biggest reasons that many of us make unhealthy choices throughout the day, or as soon as we get home at night, is the lack of planning. Instead of rushing around all day, forgetting to pack a healthy lunch, and resisting the ever-tempting McDonald's (hopefully); we can rush around all day, grab a homemade chicken salad around noon, snack on a protein bar around 4 o'clock, and then comfortably make a healthy dinner. There is no right or wrong time to eat during the day so if you have a busy schedule, accept it and work with it! Finding what works for you means finding what works with your lifestyle; otherwise, "finding what works for you" just becomes another trendy diet that you don't stick to. Pack, prepare, and plan to have meals on the go, enjoy the foods that make you feel good, and remember that this is your life and your body that you're working with. Step three is all about putting your goals, wants, and thoughts to the test. It's time to do it - to actually eat foods that you want, work with your schedule, and start seeing results. But, before you roll your eyes and think "easy enough!" - you have to be prepared for some trail and error. If trial and error sounds more like failure to you, rest assured that it kind of is, but in the best way possible! How can failure actually help you to find what works for you? Well, by doing exactly that. 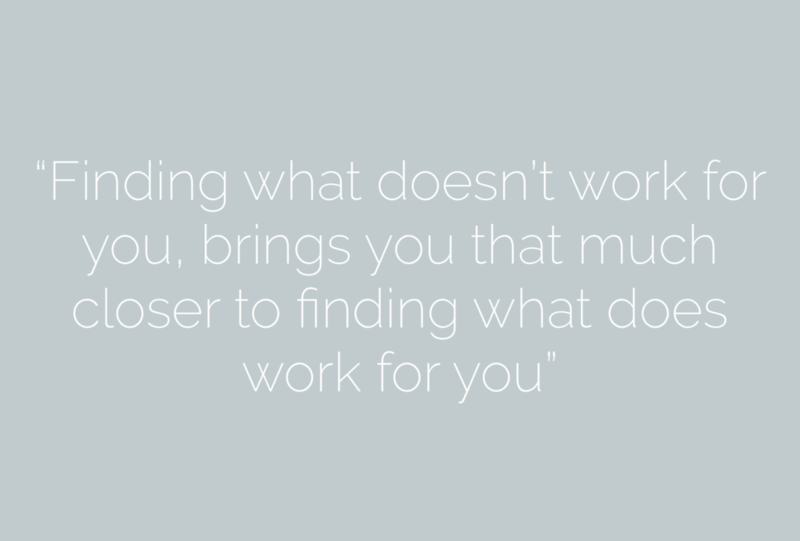 Inevitably, finding what doesn't work for you, brings you that much closer to finding what does work for you. You will find what works for you, but it might not be right away. I'm three years in and there are still days that I can't figure out why I feel or look the way I do. I change goals, adapt to new schedules, and indulge more than I should. Finding what works for you is literally trying different and new habits, adjusting to life, changing your mindset more than once, and failing along the way. Trial and error gives you the opportunity to dabble into new territory, try it out, and see how your body responds. Maybe you're someone who has always avoided big breakfasts but found yourself binging at night. Perhaps you can try eating a large breakfast with eggs, toast, and avocado - have a moderate lunch and dinner - and then drink some tea and go to bed. If your body responds well; you feel better and start to lose weight (if that's your goal) then great! Trial and error avoided! Unfortunately, it doesn't always work out in our favor. Our bodies aren't always clear with what we want or need, and we have a hard time depicting those messages. For example, maybe you're someone who loves having a light protein shake first thing in the morning but are left feeling hungry by 10 a.m. You might decide to try a new overnight oats recipe that all the IG girls rave about. You make one up, have it for breakfast, and are left feeling terribly bloated, tired, and foggy for the rest of the morning. This is a perfect example of how and why what works for others, might not work for you! It's also a great example of trail and error, figuring out doesn't work for you, and moving on. It's all about taking a chance, trying new things, and figuring out what makes you feel your best or worst. From my experience, I often found what did not work for me, long before I figured out what did work for me. None the less, each error was a stepping stone and message from my body telling me, "Eh, not for you! Try again!" And I of course did try again, and again, and again. Trying new things and accepting failure is the most important, and most personal, part of this entire process. You have to be willing to give up your favorite sugary breakfast cereal and swapping it out for a kind-of-scary, not-so-scary green shake. You have to be willing to get your sweat on and burn calories. You have to be willing to make sacrifices, keep fast food to a minimum, and spend a little more time in the kitchen. When put forth effort in the right direction, your body and your mind will respond. If you never try, then you will never know how amazing you truly could feel in your own skin. Yes, you will second guess things from time to time and no, not everything that works for others will work for you. It takes a leap of faith, a determined mind, and possibly a shot of tequila - but, it will be totally worth it. I live and breathe the Hanna diet. It consists of eating real meals when I'm hungry, eating nutritious foods that make me feel good, and eating foods that just really make me happy. I can't tell you that any one person's advice lead me to this place, because I can't tell you that any other person who knows me like I know me. I can tell you that I found what works for me by setting goals for myself, whether it was a number on the scale or wanting to mentally feel better. I found what works for me by taking a look at my life and figuring out the best way to include healthy foods that will make me reach my goals no matter what. I found what works for me by trying different foods, diets, and workout regimens, and avoiding what my body didn't respond well to. It was tough, confusing, scary, frustrating, yet so rewarding. I no longer have to think twice about guilt or shame after enjoying a burger with fries. I choose to look at my "diet" as apart of my life, rather than just a way to "look better." It didn't happen over night and it couldn't have happened without failing a few times here and there. Finding what works for you is the best and only "diet" you will ever need. It means finding a balance between "good" and "bad" foods, loving the food that you're eating and not obsessing over numbers or labels. Finding what works for you is more than a trend or faze; it's a movement, and all it takes is a little goal setting, planning, and courage to try. Questions, comments, & conversation are always welcome. For personal inquires, feel free to email or message us!